As the editor of this website, I was privileged to know him. I first met him on the auspicious date of 20 September 2006 at The Saltaire History Club, the same date Salts Mill was opened. Denys took a keen interest in the Saltaire Village website. He sent me emails and letters of encouragement and lovely Christmas cards. I received his latest card on the 17 December. It's on my desk. He was encouraging, charming and affectionate. He was great and I will miss him, as will everyone else who knew him. The cremation was held on Friday 2 January 2015 at 11am in the Evangelical cemetary of St. Peter, Graz in Austria. Interment of Denys's ashes in his mother's grave will take place in February in Cheltenham. In the 1950s, Denys began to visit Saltaire when Salts Mill was still producing cloth. He admitted that he knew nothing about his ancestor's textile industry but began to take a keen interest, effectively becoming the Salt family historian. Denys retired at 60. Almost a decade later, Denys met and married his wife, Eva Kiesling of Graz, in June 1989. 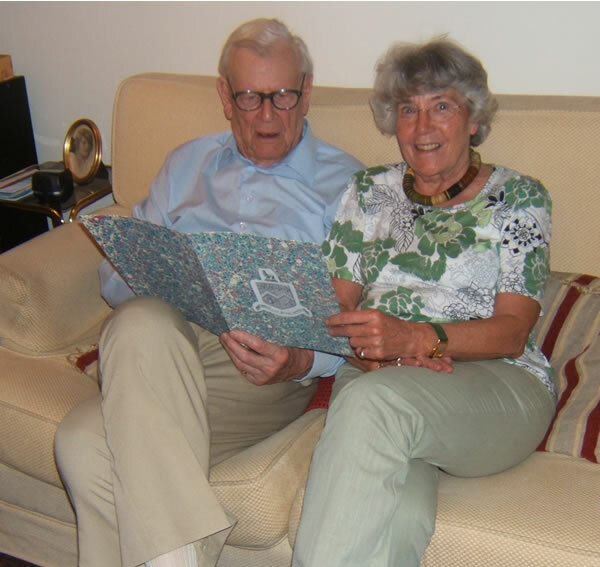 Denys developed friendships and a deep connection with the people of Saltaire and he and Eva were regular visitors. 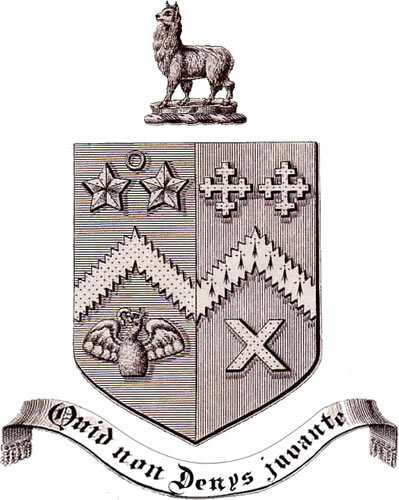 They attended Saltaire Festivals and on occasion, the Saltaire History Club. 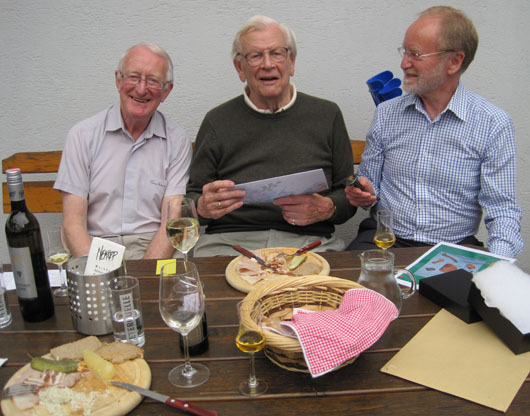 On 4 May 2008, Denys celebrated his 90th birthday in Austria with his family and friends, including Dave and Ann Shaw, of the Saltaire History Club. A special card was designed for him, backed in paper crafted by Victoria Hall and showing a tweaked version of the Salt moto. He was thrilled and described it as a "marvellous gesture." Left: the tweaked version of the Salt Moto, designed for Denys Salt's birthday card. The opening of Salts Mill on 20 September 1853, was marked by a feast. One hundred and fifty six years later (2009) Maggie Silver, owner of Salts Mill, invited guests to a lunch there with Denys as the guest of honour. Denys was impressed with the way Maggie's late husband, Jonathan Silver, had marshalled order out of the deteriorated mill and how the Silver family had cared for Salts Mill since acquiring it. Denys entertained us effortlessly with memories and anecdotes of his life. What marked his speech, delivered without notes, was his warmth, humour and modesty. His deep respect for his great grandfather, Sir Titus Salt was obvious. He was thrilled with the interest shown in Saltaire's history and its future. Denys's wife, Eva, sadly died on 20 May 2010. He wrote that he had lost, 'the best person in the world.' Eva's funeral was held in Graz at the local Evangelical Chapel on Friday 28th May. It was attended by Dave and Ann Shaw of Saltaire, and the late Rev. Paul Breeze of Saltaire's United Reformed Church. 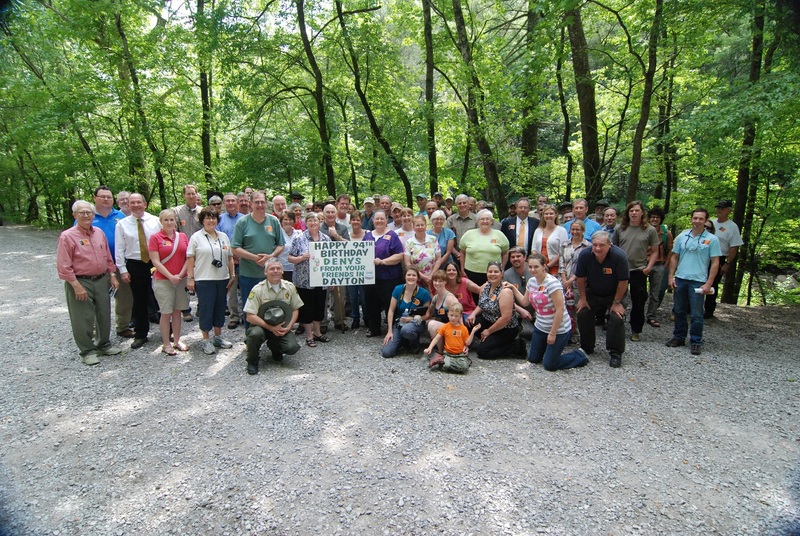 In 2011, Saltaire historians, Dave Shaw and David King were in America investigating the history of the Salt family's Dayton venture, an erstwhile coal & iron company in Tennessee. On the 4th May, Deny's 94th birthday, the Dayton community, valuing their connection with the Salts and Saltaire, found a way of saying Happy Birthday. Denys once again journeyed to Saltaire in September 2012 for the Saltaire Festival. 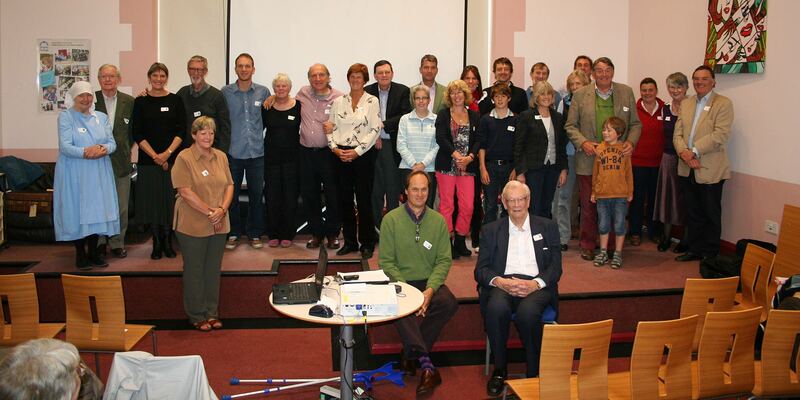 During the festival, the Salt Symposium took place - a gathering of the decendents of Sir Titus Salt and Sir James Roberts, to meet and share their history and cultural background. It was a happy occasion fo Denys, the most senior Salt, to be surrounded by family members. 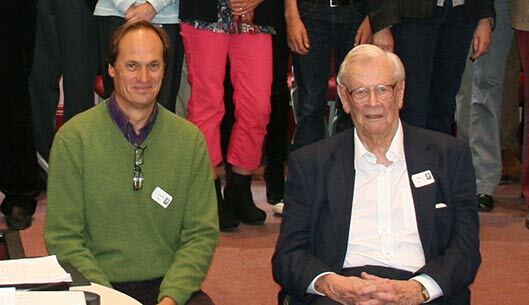 In 2013, Denys celebrated his 95th birthday in his home town of Graz with Dave Shaw and David King. Denys was delighted to receive his birthday card signed by so many of his friends in Saltaire (& Tennessee!). During 2014, Denys kept in touch, as always. His interest in Saltaire and the people who care for Saltaire, remained undiminished. For those who knew him, he was a shining light, an inspiration and a real friend. He will be dearly missed.